HALLOWEEN has always been my favorite holiday. When it comes to dessert, my tastes have matured towards the more gourmet. But just because I am an adult doesn’t mean I can’t enjoy the fun of Halloween candy. This year, I wanted to create a Halloween treat for adults. Something not to be gobbled, but savored. As a kid, I thought shelled walnuts looked like tiny little brains. This gave me an idea: What if I coated them with candy for Halloween? Envisioned eating handfuls of tiny candy brains…laughing maniacally. That could be fun. 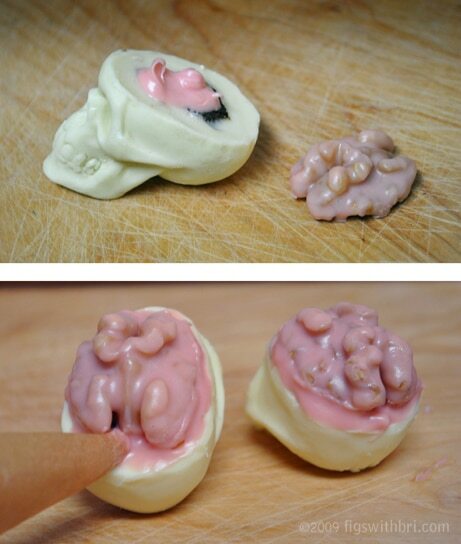 If they were placed in miniature edible skulls, it would really put them over the top. 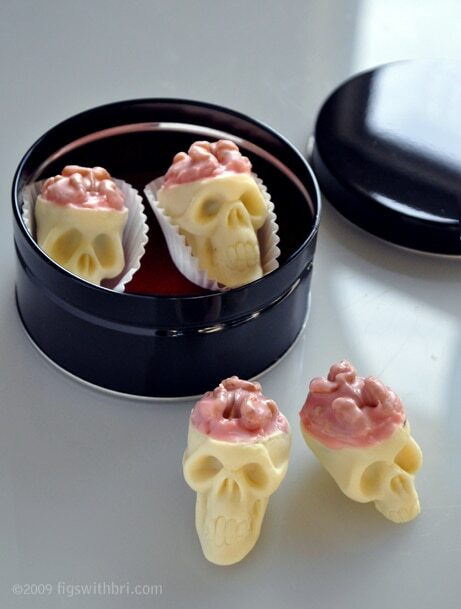 If those skulls were white chocolate… Well, now we’re talking! Just needed a way to make the skulls. Sculpting each one with modeling chocolate would quickly become tedious, so making some sort of mold seemed like the obvious solution. Besides, modeling chocolate isn’t exactly the best tasting stuff on the planet. Perhaps it would be worthwhile to make them into some sort of crazy truffle. A white chocolate shell with a surprise bittersweet center sounded tasty. The trouble with skulls is they’re quite complex with lots of nooks and crannies and undercuts. To do a somewhat realistic version would normally require sophisticated (i.e. expensive) multi-part molds. Luckily, I recently learned there are several companies that sell food grade silicon mold materials. The extreme elasticity of silicone made it the perfect choice for this project. I could use a one part mold and still get all the detail I wanted. I ordered the silicone from MakeYourOwnMolds.com Plan to try the silicone Plastique in the future, an easy to use 2 part putty, when I have a less ambitious shape to mold. This time, I got the CopyFlex 2-part liquid silicone set with platinum. It’s a bit expensive, costing me around $30 for enough material to cast a 4 skull mold. Started by sculpting a couple of walnut size skulls in polymer clay. The clay is easy to work with and readily available at craft and art supply stores. Once baked the clay becomes rock hard and can be sanded or even painted to achieve a smooth finish. I skipped the sanding step since I didn’t think the truffles needed to have a glossy sheen. TIP: If you haven’t worked with polymer clay before, brush the finished surface down with denatured alcohol to smooth it out before baking it. The alcohol melts the clay a bit and will blend in any fingerprints you might have left on the surface of the sculpture. 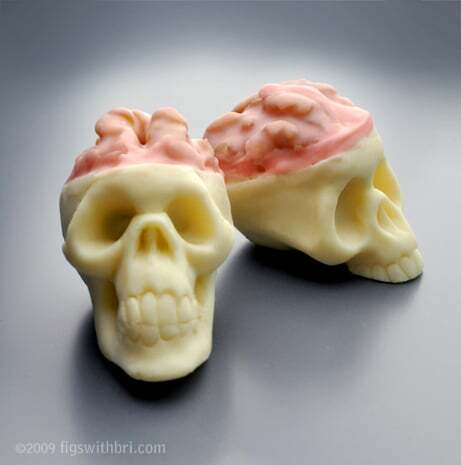 The silicone mold will pick up every detail, including fingerprints, so it is best to take care of this up front, or you will have unappetizing prints all over your chocolates. I made a simple box mold using a sheet of acrylic for the base and hot-gluing four strips of acrylic about 1/4” to 1/2” from the edges of the skulls. ~ Make sure the side pieces are deep enough to leave a minimum of 1/4” above the highest point of your original sculpted pieces. 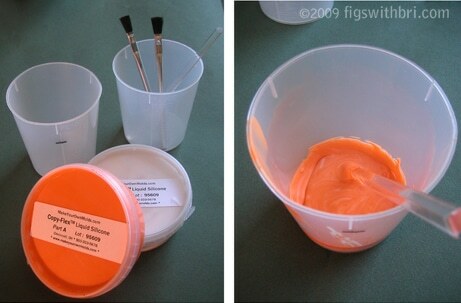 ~ Seal all of the sides thoroughly, so no silicone can ooze through the cracks. TIP: Have a roll of tape handy in case you need to seal up any leaks that appear when you pour the mold. ~ Secure the pieces to be molded to the base. You can use double-sided tape, Anchor-Dit (from MYOM) or hot glue like I did. TIP: If you care about keeping your originals intact, avoid the hot glue. I didn’t care about them, so I just used what I had. This is an important step, because the last thing you want is to have your originals break free and float in the silicone. You would then need to wait for it to cure, cut them out and start over. amount on the cup and you now know how much silicone to mix up. TIP: You will need to make a little bit more than this, because the silicone can be thick and will adhere to the sides of your mixing container. You will not be able to get it all out and into your mold. ~ Brush out your mold and make sure it is clean with no dust or bits of rice or tapioca. The silicone comes in two parts that you need to mix together to cure. One part is a bright Halloween-appropriate orange. cast. 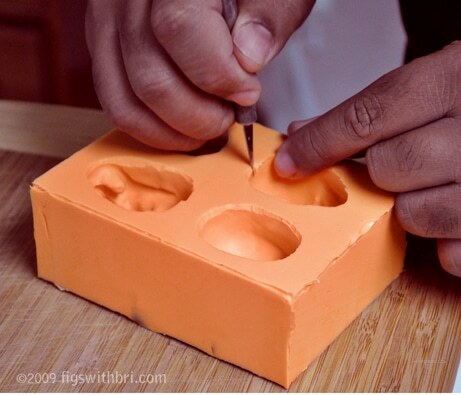 The point is to embed the silicone in the details so no air bubbles are trapped against the nooks and crannies of the surface, ruining your mold. 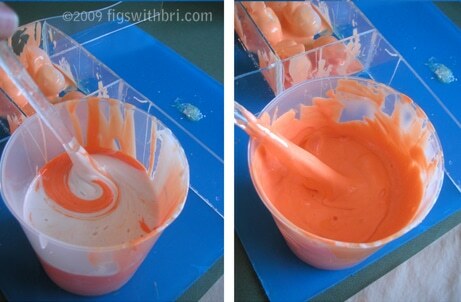 ~ Now stir the remaining silicone together, carefully scraping down the sides until all swirls disappear and it appears to be a uniform color. TIP: Do your best to avoid mixing in too many air bubbles as these will adversely effect the quality of your mold. 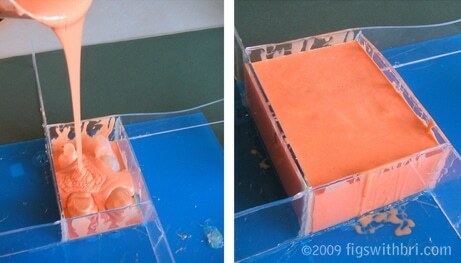 ~ Pour the silicone from a height of about 12” above your mold. 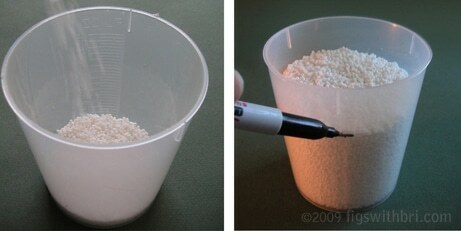 Called a ‘stretch pour’ it will help eliminate air bubbles incorporated in the silicone during the mixing. ~ Pour it in one spot, like a corner or somewhere not directly on top of the original, and allow it to slowly creep up over the original pieces until they are totally immersed. ~ This brand of silicone cured completely in about 4 hours. You can easily check to see if it is done by pressing a coin in the surface to see if it leaves a mark. Cured silicone will spring back immediately, leaving no imprint at all. ~ Once set, you can break away the walls of the acrylic mold box. ~ Pry the silicone off the originals, being careful not to cut or damage the surface. I used an Xacto knife to carefully remove some silicone that had seeped under the skulls. I would prefer to go all organic fair trade with the ingredients, but I blew my budget on the mold materials. Since I have a completed mold, I may use organic chocolate next year. This time I used Callebaut bittersweet chocolate for the centers and white for the skulls. I think it is essential to use the best quality chocolate you can afford. A lot of cheap brands of chocolate use wax as filler and won’t give you delicious results. Making ganache is the easy part of the project. ~ Simply chop up whatever quantity of chocolate you want and place it in a bowl. ~ Heat about half that amount of cream in a double boiler, stirring until small bubbles form around the edge. ~ Pour the hot cream over the chocolate and stir until all the chocolate melts. 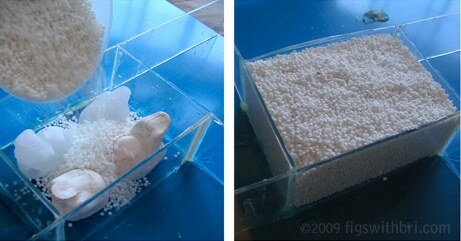 ~ Pour into a bowl and press plastic wrap down over the surface to seal out any air and moisture. Place in the freezer for a couple hours or in the fridge overnight. ~ Once it’s set, use a small melon baller to scoop out pieces and place them on a cookie sheet covered with parchment or silpat. TIP: It helps to dip the melon baller in hot water or hold it over the stove flame for a few seconds before scooping. ~ Roll the chunks between your palms to roughly form them into balls. ~ Return them to the freezer. Bri wrote about our truffle making adventures two Christmases ago. From that experience, I learned truffles can be made at home, but that tempering chocolate is exacting and requires the right equipment and precise timing. You need to follow a specific three-step process. If you let the chocolate fall out of the tempered zone by even one or two degrees, you need to start the whole process all over again. I will briefly discuss the process here, but if you want to try making truffles yourself, read Bri’s more detailed post first. ~ Chop the quantity of chocolate into fine pieces. TIP: It helps to make it in batches of close to a pound or more, so it can maintain the temper temperature. ~ Scoop 3/4 of the chocolate into a dry bowl or your double boiler. TIP: Make sure there are NO drops of water in the bowl or the chocolate will seize up and can’t be tempered. Water and steam are to be kept out of the bowl at all costs or you will need to start over with fresh chocolate. Tempering chocolate requires taking the chocolate through three temperature zones. ~ Place it back over the double boiler in 10 second increments, stirring well until it hits 86°F-88°F It should now be tempered. ~ Dip a clean knife blade in the chocolate and wait 3-5 minutes to see if it hardens to a satin shell. I have heard that placing the bowl on a heating pad works well to maintain the temperature. I didn’t have one, so I took it on-and-off of the double boiler…constantly stirring and checking to see if I was in that magic zone. This is the part that was the most difficult Keeping a bowl of chocolate in a 2 degree window is crazy without the right equipment. In the end, after having to re-temper 4 times, I just crossed my fingers and hoped I had done everything right. I got lucky. ~ Once you have tempered chocolate, you can fill the molds. I tried two different methods. The first method is depicted in the photos. It required two different applications of tempered chocolate, which quickly proved frustrating. ~ The best technique was to scoop the white chocolate into the mold, filling it completely. Place it in the freezer for 2 min. ~ Remove and lightly press the bittersweet ganache centers into the cranial area, making sure not to push too far (if you do, the dark center will touch the mold and you will have a dark spot visible on the surface of your white chocolate skull). ~ Replace it in the freezer for 5 min. ~ Cut the tops flush with a spatula. Let them set up completely. ~ The skulls are a bit difficult to remove from the mold, but a gloved finger wedged under the cranium seemed to be the best way to pop them out without any damage. ~ Pour the candy melts into the double-boiler. TIP: I had to thin mine out a bit to get them to glaze the walnuts without obscuring the details too much. The brand of candy coating I had called for vegetable shortening, but I added grapeseed oil and coconut oil, since I don’t use shortening on principle. ~ Once the candy was melted, I used a truffle fork to dip the walnut halves and transferred them to a plate to set up. 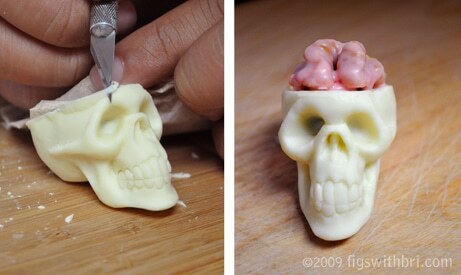 ~ Assembled the skulls with a dollop of candy or chocolate to glue the ‘brains’ in place. ~ Then piped a little candy around the edge to seal it and complete the illusion. ~ Boxed the finished skulls in black tins with red velvet lining. Everyone I have given them to has been surprised…and delighted. A few even laughed out loud! That’s what satisfies me the most about creative projects. They bring out the kid in all of us. SPECIAL NOTICE for skull truffle admirers. These creative, one-of-a-kind candies are much too expensive ($40 worth of materials alone…at 2009 costs) and time (hours and hours) to sell them once a year. Marc has posted the directions on Instructables, where it’s gotten well over 7600 views. If you’re ambitious, dexterous, and artistic, give them a go and have fun! Marc’s been mulling this idea over for a few years. And it took a couple of weeks in his spare time to sculpt & create the skull model, the molds, etc. I was his sous-chef in the chocolate tempering & re-tempering phase (several hours worth of work)…at least for the first pour until he stream-lined his technique. A few of us, friends & family, think he should consider selling these wacky gourmet Halloween treats. How much do you think folks would be willing to pay for a tin of two? I adore these! They may taste yummy but they are truly works of art. 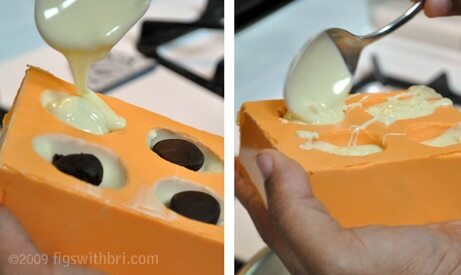 You could sell the molds with the recipe easy! Absolutely amazing! I’d pay top dollar for these! Those are so crazy cool! By far the most awesome Halloween treat I’ve seen this year! Funny, as walnuts truly are the “brain” food. This creative vision deserves marketing. Someone like me would have to buy them as “Treats” for very special people as I could never use my limited time to go there. Selling the molds is a great thought. Really love this. Wonderful. Wow, I am deeply impressed. They are amazing. The sculls and walnut brains look perfect! I’d pay for them – definitely. But it’s such a lot of work, no idea if it pays out for you. Walnuts always reminded me of brains too! This is really creative way of putting that concept into use! I am in complete awe! Fabulous job, Marc! The folks who got these treats are very lucky indeed! That is so creative! You never cease to amaze me! That is really out of the world!..great job and yes the folks who got this are really lucky to get such labour of love!.. Thanks for all the enthusiastic comments. It was a fun project. I have some ideas for other chocolate shapes that I might try in the future. If I only had a chocolate tempering machine, I would make truffles more frequently. wow, that’s an amazing project — so cool that you can merge your artistic skills with your food skills. if you decide to do this a lot, I think a tempering machine makes a lot of sense. I know they’re not cheap, but your time is valuable. Now that’s what I call talent Marc! Amazing! You have so much talent & the patience to go with it Marc. I truly wish I lived in your neighborhood now..
Aww….shucks! You are all so kind. Anita – Yeah, there might be a tempering machine in my future. I have added it to my mental kitchen wish list along with an iSi soda siphon and a torch to make crème brûlée. Helen – Thanks! That means a lot coming from the queen of desserts! Shankari – if you lived closer, you would definitely get some Halloween truffles! wow, that’s really awesome! great step by step pics too! those are really cool and creative! wow – you are so creative . you are my inspiration! my dad loves it when I make him stuff – he lives in AZ – how couls I send him candy that usually needs to be kept in the fridge and then served at room temp? BUT! You did such a great job on the sculls, wonderful details, and probably delicious. And if it was possible to buy them I would probably buy at least one for each person in my family, that would be 12 person, and for that I would pay from 24 to 34 $ Just to give them something more special. I LOVE your tutorial! I placed the link to it in the Halloween_Food group on yahoo. This is brilliant! Wow, great job here. Awesome picture too! You should really consider submitting this to Recipe4Living’s Ghoulishly Good Halloween Recipe Contest – http://www.recipe4living.com/articles/ghoulishly_good_halloween_recipe_contest.htm – It looks delicious! wonderful!!!!!!! you did fantastic chocolates spectacular! good!!! Creepy!! and delicious!!! Great pictures and explanation. I believe I can even do them and get some credit in my family! Looking forward for next halloween! I just discovered this fantastic project. I am so impressed! We’d love to include your tutorial in the Customer Showcase on our website (http://www.makeyourownmolds.com/customer-image-gallery) and possibly also as a Facebook album. Would that be okay with you? We’d happily link to your blog and include a blurb about you and your business. Take a look at the Showcase and let us know what you think. Dominic – I would be honored to be included in your showcase. This was a really fun project. I had been thinking about doing it for years, but finding out about the food grade mold material inspired me to actually make it happen. I look forward to experimenting with some of the other products as well. I have a few other ideas I want to try. now that’s a great idea. Thank you for this post.